What if you were to learn that local police departments, sheriff’s offices, and school districts have been awarded grant money from the Obama administration for doing just that: looking the other way when certain crimes have taken place? On purpose, so as to change the racial proportion of the prison population, among many other things? The article is about efforts undertaken to avoid arresting students. And the article speaks to the concern that Broward County might have turned a blind eye to the behavior of Nikolas Cruz because they wanted to lower the number of student suspensions, which is a big part of Obama-Holder prison reform. So this is five-year-old story. Well, four and a half years old. It’s December of 2013. “The story behind the so-far successful crusade to end disproportionate student arrests and suspensions in one Florida school district. When, after a nationwide search, he was hired two years ago to serve as superintendent of Florida’s Broward County Public Schools, Robert Runcie began brainstorming ways to close the racial achievement gap. So you see the way this works if you’re a leftist, you don’t count the crime. You look at the percentage of arrests and imprisonment, and you compare that to the population at large, and you find racial bias. And the only way you can do that is if you assume that many of these crimes being committed by minorities are not really being committed, that they’re only being charged because there’s a racial bias in the police department or the sheriff’s department. And that racial bias is indicated by the exorbitant percentage of African-Americans and minorities in jail or in prison and your belief that it wouldn’t be there if it weren’t for racism. So you start out by claiming that law enforcement is corrupt because they’re targeting minorities who aren’t committing crimes, they’re arresting them and imprisoning them, and you want to fix it. That’s the starting point for this. They say, “Look, the black population is, what, 15% of the country, but in the prisons it’s 70%, that proves bias.” It doesn’t, unless you’re a liberal. It doesn’t prove anything of the sort. It proves who’s committing the crimes. And if you don’t like that, if you’re Obama and Holder and you don’t like that, then you want to change that, the only way you can do it is by ignoring some of the crime, not charging, not arresting, and not imprisoning, to change the percentages. So Runcie is claiming here that he saw a whole lot of racial discrimination here in the way minorities were treated in the criminal justice system. “Broward announced broad changes designed to mitigate the use of harsh punishments for minor misbehavior at the beginning of this school year.” Remember, this is 2013. “While other districts have amended their discipline codes, prohibited arrests in some circumstances –” let’s not gloss over that. Now, not because of the change in the behavior of students, but because of a change in the philosophy of pursuing them. So now I turn to a little piece here from Conservative Treehouse. There’s a writer at Conservative Treehouse that goes by the nom de plume of Sundance. So how is it that four armed cops remained outside the building and didn’t do anything? How is that possible? Well, here’s what people don’t understand. “When the county education policy is intentionally constructed to ignore criminal behavior in schools, the sheriff and school superintendent cannot rely on ‘law-and-order-minded’ school” resource officers to carry out the corrupt policy. That’s what Peterson, the guy that was outside armed and didn’t go in is called a school resource officer. And it is the contention here that these people are political appointees, not law enforcement specialists. And they are there to carry out and see to it that the political aspect of this equalizing jailhouse population policy is instituted. So the American Prospect has the details. Conservative Treehouse following up on them here. Local governments were rewarded with grants if they kept school arrests down, the cover being, “Let’s stop the pipeline from schools to prison. Without arrests, there’s no record in background checks to keep violent people from having guns. And then we learn that something like, what is it, 18 states don’t even report data to the background check system? So what good is it, if the data isn’t even there? If there were perps that are not being arrested, that are not being charged, they will not show up in a background check when they go to buy a gun. And there is or was an Obama administration policy to change this prison ratio under the guise that it was built by bias and racism. No matter what steps you put into place to prevent these kind of people from getting guns, if the procedure is corrupted, it’s not gonna be worth anything. And if deputies are ordered not to intercede — this is the key element here — if the policy is to not arrest and not to pursue certain perps and then deputies show up at a live school shooting and are following orders not to intercede or if they’re permitted to just stand by and wait for SWAT, then they’re gonna be useless as protection. And when all this is happening, we all do what? Point fingers at the NRA. The background check system may be horribly corrupted with inaccurate, incomplete, and in some cases no data and that what’s going on right now is an effort to make sure nobody learns about this. So you keep pointing at Dana Loesch, you keep pointing at the NRA, you keep pointing at Republicans or Trump or what have you. And then you have the students come out and get in on it, and then you tell everybody you can’t criticize them because they were shot at, they’re victims, they’re traumatized, so you’ve gotta give them a pass. 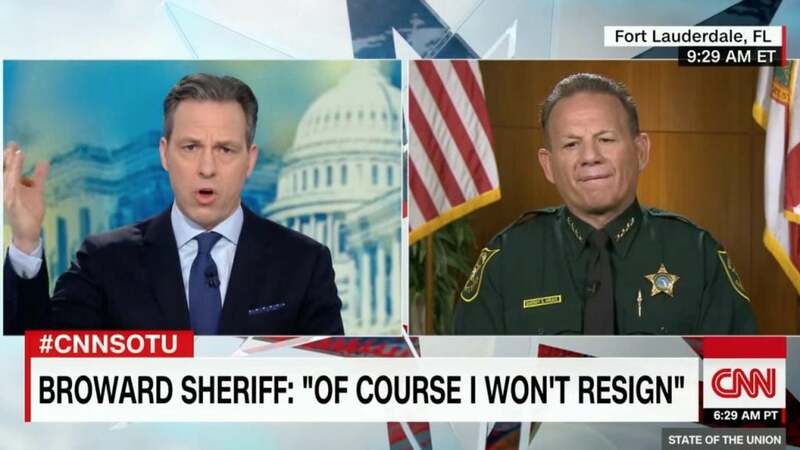 RUSH: You know, it turns out that Sheriff Israel was actually asked about this program on CNN yesterday by Jake Tapper. The only thing missing from the question was that it was an Obama-era program. Here’s the question: “A lot of people in the community have noted that the Broward County School Board entered into an agreement when you were sheriff in 2013, to pursue the least punitive means of discipline against students. RUSH: That’s exactly. Jake Tapper is on the warpath here, but… (laughing) The PROMISE Program! I’m telling you what this was! This was an Obama-era program authorized with his buddy Eric Holder at the DOJ, and they paid these school districts money to do this! They got more money for every arrest they did not make! The money became the reason for excusing certain behavior so it won’t show up in the background checks! So it’s got nothing to do with the background check, got nothing to do with the NRA, got nothing to do with anything other than the federal government… (groans) It’s just… It never changes. It just never does. RUSH: We’re gonna start Fort Wayne, Indiana. This is Dave. It’s great to have you, sir. I’m glad you called. How you doing? CALLER: I’m doing well. Thank you, Rush. CALLER: I’ll get right to it, and you touched on it. You know, normal police procedure, you do not go in without back up. And the one thing they noted, the Officer Peterson I think was on his radio, and I’m just wondering if this is another part of possibly CYA, he did not go in because he was possibly told not to, wait for backup, wait for SWAT. Well, by the time they got there, of course, we had 17 deaths. So that’s basically what I wanted to say. If I could say one more thing. In our area, we’ve had two teenagers arrested in the last week for being on the internet making threats to local schools. No gun involved, no gun involved, simply in their minds and what they put on the internet. RUSH: You support those arrests or not? CALLER: Yes. The arrests of the teenagers? CALLER: Yeah. My point there was no gun involved. You know, it’s always the gun, the gun, the gun. My point is, there was no gun. This was simply on the internet making threats. And you don’t hear a whole lot about that. It’s only when the gun is involved. RUSH: Well, I was thinking about something else when you mentioned this. So they get on the internet and they make threats. That’s the First Amendment. I mean, there was all kinds of that and more going on in Florida that was ignored. Now, wait. No, my point is Sheriff Israel said we can’t stop people doing that. We need permission to go get people we know are gonna act before they act. That was one of the first things Sheriff Israel said before all the latest controversy descended. Before we knew there was an armed deputy there, Sheriff Israel made a point of saying we need changes in the law to allow us to go get these guys off the street before they act. Well, it sounds like that’s exactly what happened at Fort Wayne. And where are the civil libertarians complaining about it. Maybe they don’t know yet. Maybe they’ll hear about it now and maybe you’re gonna have a problem up there. “No, they did, Mr. Limbaugh, make threats. I mean, that’s not dangerous in and of itself, Mr. Limbaugh. They’re on the internet. You can’t stop them for that.” Don’t be surprised if that becomes a reaction, because the sheriff in Broward County said he couldn’t do that. He asked for specific laws to make that possible. Now, your point was that there wasn’t even a gun involved and they were still issuing threats. I got that. Well, my overall take of the sheriff in Broward County? Overall take of the sheriff in Broward County. That’s a long answer. I could try to synthesize it. The short answer is politics. Politics has corrupted everything, when it gets into matters of where there shouldn’t be political considerations anywhere near the top, law enforcement. Look, I’m not naive. I know that politics is everywhere, and that’s one of the reasons I believe so much has been corrupted. But for the guy out there to claim while in the aftermath of everything we now know that he has been exhibiting great leadership, I mean, this guy wants applause. This guy wants a medal. He thinks he has done a great job. Now, that tells me something’s really wrong in our culture. This is the trophy generation. Give me a trophy for showing up. You’re the Broward County sheriff, you put on the uniform every day, there’s people committing crimes, and you hang in there, here’s a trophy for great leadership. (interruption) What? I know. Four of them now. I know. Four of them. SWAT, by the way. One of the reasons that the president is speaking in favor of concealed carry personnel in the schools is how long it takes SWAT to show up. SWAT is three- to five-minute proposition. Three to five minutes, this event was over. You need somebody in there before SWAT arrives. We had a guy capable of going in and didn’t, maybe our caller says he’s gotta call for backup, you don’t go in alone. I don’t know. On the face of this, none of this makes any sense. None of the procedure. None of the procedure makes any sense. And then as I say, when all of this doesn’t happen, what should have happened doesn’t happen, you end up blaming the NRA? Politics has corrupted this. We’re not able to correctly describe this which means you can’t really bore down and fix it where it needs to be fixed. Let me keep going. Little Rock is next. This is Kurt. Great to have you, sir. How are you doing? 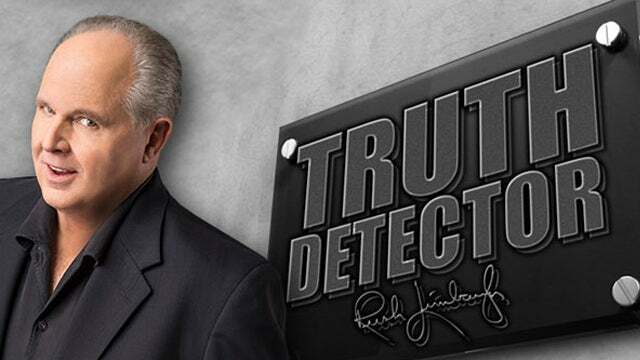 CALLER: Doing well, Rush. 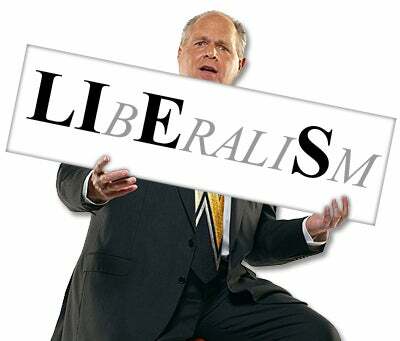 Rush, as usual, you are spot on. I retired from 26 years in the military in 2008 and continued my service as a teacher. I went to the Detroit city school district, and I only stayed six years. What drove me out of education was — and it was in 2013 — was this PROMISE Program that you’re talking about. I had been assaulted — nothing was done — in the hallways of the class. But in 2013, our class fundraiser received two counterfeit 10-dollar bills. The student that noticed it, that they had identical serial numbers, remembered who gave them to us. And it was the school’s basketball star. We went to the financial secretary and found out that over a thousand dollars had been passed through the school’s cafeteria already. We immediately went straight down the hall to the dean of discipline to report it and were told that we should be ashamed of ourselves, that this was this young man’s way out of the city, and that it would destroy his athletic future. RUSH: Wait a minute. Wait a minute. This sounds sadly believable. This really happened, right? CALLER: Absolutely. I assure you. RUSH: At the same time, it sounds outrageous. I can just see the sniveling dean of discipline talking to you. I could just see this guy mocking you for being insensitive and not realizing that it’s this guy’s ticket out and who are we to judge? And stupid bromides like that. CALLER: It gets worse. My senior Army instructor, because we were with the JROTC program, fine program in Detroit and other schools, but we called the Detroit Secret Service. We weren’t gonna tolerate that. We said, “This is ridiculous.” I think within an hour a Secret Service agent arrived, came into our office, gun, badge, the whole nine yards, and he began to explain to us about how the school has its own diplomatic immunity and that these things he can’t even take action on it unless the school — I remember asking him what if I had counterfeited the 10-dollar bills? He said, “I would be taking you out in handcuffs right now.” I only lasted a few months after that. RUSH: Wait a minute. This guy actually admitted — the Secret Service agent admitted that to you? CALLER: He explained it to us. He was very proud to talk to us. My senior Army instructor was a West Point graduate. We’re all retired of course, teaching the ROTC program, but he felt like he was with brethren, I suppose. So, yeah, he actually told us that. And I have his card at the house. I could remember who he was. I’ve called the Detroit Free Beacon, which it seems to be the most conservative newspaper there, and they weren’t interested in doing a story on it. I was also shot in the back by a squirt gun full of urine by a student and they refused to charge that student. RUSH: Why? Because a pistol full of urine was his only way out? CALLER: Exactly. And I loved my students, Rush. You wouldn’t believe some of the jewels that are in the Detroit city school system when they arrive as freshman. Bright, articulate, smart. I taught at a college preparatory school there, and by the time they had reached their senior year, it’s horrible. At the time I was teaching, Occupy Wall Street was going on, and they had these students teaching them how to protest. They were making up their own occupy signs and walking through the hallways getting applause. RUSH: The PROMISE Program. There you have it, folks. Plant a little seed here in the first half hour of the program, and look at what we are learning. Now, keep in mind what this is. This is a grant program. It is the Obama DOJ. It means Obama and Eric Holder, and they are promising local school districts grant money to look the other way when certain people commit crimes, misdemeanors, felonies, just look the other way, the express purpose supposedly to change the school-to-prison pipeline. They wanted to lower the percentage of minority prisoners because they felt the percentage of minorities in prison was exorbitantly high due to racism. 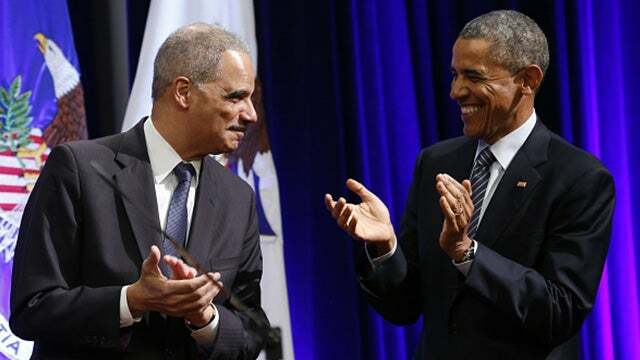 In other words, Obama and Holder contended that there were a lot of innocent people in jail who hadn’t committed any crimes simply because they were minorities and that racist law enforcement was targeting them. So this program set out to change the percentage of the pipeline and offered grant money to look the other way, essentially, to not report certain crimes. In this case, in Detroit, we’re hearing now that a thousand dollars of counterfeit money was passed through the schools, and the dean of discipline said we gotta look the other way. This is a star basketball player, it’s his only way out, his only ticket out, we can’t do anything here. It’s exactly the program. And the reason, folks, that the dean of discipline did that, was money! These school districts don’t have any money. Nobody has any money. We’re $20 trillion in debt. Nobody has any money. Except the people that run the government printing press. All these budgets are overrun. And so here comes Uncle Sam offering all kinds of money if you do this, slam dunk. Runcie, I wanted to remind you, the PROMISE Program was started in Chicago. That’s where it was first implemented. And the current superintendent in Broward, Mr. Runcie, was recruited from Chicago to bring the PROMISE Program to Broward County. He was in the Chicago public school system specifically to fix the schoolhouse to jailhouse problem in Broward, and he was hailed as a hero as suspensions magically dropped by 40% and arrests dropped by 66% in just two years in Broward County. They just stopped arresting and they stopped suspending. The crime didn’t change. What this meant was, it was possible that a bad actor remains in class rather than be suspended, all because of the Obama DOJ program. But more importantly, whatever actions of a criminal nature they took are not reported, there’s no arrest, therefore these people don’t end up in the background check database. So when they show up to buy a gun — how many times have we heard, by the way, in all these school shootings that the perp passed a background check? And of course what do we infer from that? We infer that kid was fine at some point. Must have just snapped. Well, we’re not ever told why they passed the background check. Maybe they didn’t show up. Maybe their name wasn’t in the database because the criminal behavior they’d engaged in had not been reported. So, you know, it’s a garbage in, garbage out-type thing. 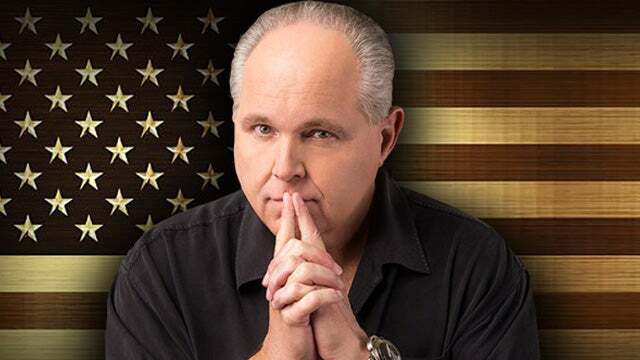 RUSH: Now, one thing here, folks. The PROMISE Program. They couldn’t just tell the cops to ignore minorities. That was the objective, but they couldn’t just tell the cops to ignore minorities. Obama and the Holder were not that dumb. So don’t misunderstand this. That would be illegal. (chuckling) Funny. 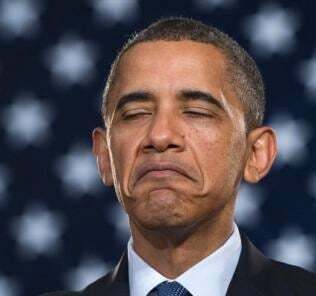 It would be illegal for the Obama administration to tell anybody, “Look, whenever minorities commit a crime, look the other way.” That was the desired outcome. But they could never say it, just like liberals can never be truthful about their real objectives overall or from policy to policy. So what they had to do was ignore many infractions from a lot of students no matter their race. Hence, Nikolas Cruz. This is exactly… This sounds like exactly how this happened. You can’t just… If you want to change the school-to-prison pipeline, you can’t cherry-pick. You’ve got to go soft on all infractions. ‘Cause I know a number of you are probably shouting at the radio, “Wait a minute, Rush! It makes no sense. Cruz wasn’t a minority.” Exactly. It’s a good question, and the point is they had to ignore a whole lot in order to chief this objective. And school districts didn’t care. They got money for everyone they ignored. That’s how the grant process worked. 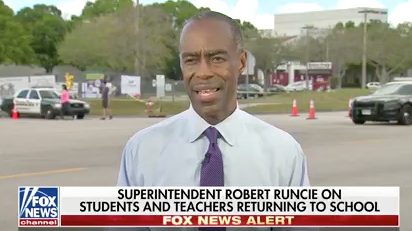 Now, as for Superintendent Runcie, back in 2015, he was invited to join Obama’s White House School Discipline Summit “to share his secrets to success in lowering student arrests and suspensions.” ‘Cause they thought that was a magic thing. “How are you doing that? Wherever this guy goes, there are many fewer student arrests,” and everyone wonders: How’s this guy doing this? Is he changing behavior? It turns out, no. That’s not what was going on. “In 2016, superintendent Runcie was named Florida’s Superintendent of the Year.” But if you… Let’s just see. Let’s just… Jake Tapper, in his questioning of the sheriff, had it exactly. The one thing he didn’t mention (and I don’t know whether he knows it or not) is the origins of the PROMISE Program, but it’s not a Broward program. It started in Chicago, and its success there, I think, is what inspired Obama and Holder. It could be the other way around. But let’s see how far some of this has taken. RUSH: By the way, we just played the sound bites of Jake Tapper asking Sheriff Israel of Broward County about the PROMISE Program and perps not being arrested and not ending up in the background check system. I am told… I mean, I’m not a Twitter denizen, but I am told that Tapper was ripped to shreds on Twitter for questioning Sheriff Israel about the PROMISE Program. So the left is… They’re poised. They are ready to deal with this if it hits. Jake Tapper got a little treatment.